Eating with a Paleo or Primal approach can seem daunting when you realize that you are no longer going to rely on the cheap, filler ingredients you may have become accustomed to buying on a regular basis. No more rice and beans. No more bread, pasta or cereal. These are all cheap foods. And rightfully so; they provide poor nutritional value when you compare them to vegetables, meat, fruit, nuts, seeds and quality fats and oils. The concept of a Paleolithic or evolutionary approach to eating is that we rely on whole foods that are in a very edible form as they exist in nature with very little “processing” required between when it's picked or killed and when it's eaten. This is the biggest part of an evolutionary approach to eating that resonated with me, besides the fact that it's based on consuming whole foods of high quality. That said, getting your hands on the best quality vegetables, fruits, meats, nuts, seeds, fats and oils can be cost prohibitive if you're trying to buy the top of the line ingredients across the board. These are my tips to help you to navigate which foods are the most critical to buy at the highest quality level and which you can set lower on your priority list and save for the times when you have some extra cash to spend on your food. Though it's also linked at the bottom of this post, to grab my “Quality Matters” PDF Guide, click here. Buy the highest quality fats and oils that you can. My go-to fats for cooking are: organic extra virgin coconut oil, organic grass-fed (or at least organic) butter, organic grass-fed ghee and pastured pork bacon fat that I save from baking bacon in the oven (if I eat non-pastured bacon I toss the fat). I keep my coconut oil and ghee in the cupboard and my butter and bacon fat stay in the fridge. I think you can keep ghee in the fridge as well if you're concerned about it going off, but it should be okay at room temperature. Don't refrigerate coconut oil as it will become extremely hard and difficult to use without re-melting. My go-to oils for salads and using in raw recipes are: organic, cold pressed extra virgin olive oil and organic cold pressed sesame oil (which I don't use too often). I store my sesame oil in the fridge if I have it on-hand. Grass-fed cows = good eats. Click to find grass-fed cows near you. Buy lean cuts of conventional meats, and cheaper cuts of grass-fed, organic and pastured meats when you can. When we're tying to keep the quality high, choosing conventional meats with as little fat as possible is the way to go. Why? Well, like in humans, animals store toxins in their fat. That means that if you're eating an animal that may have been exposed to poor quality food, chemicals, antibiotics and exogenous hormones (from an outside source other than their own body's natural form), most of the residue from those toxins will be in the animal's fat. What's interesting is that meat in the US gets graded on “marbling” or the amount of fat that swirls through the meat. While that fat is tasty and I welcome the small amounts of it that end up in my grass-fed meat (which is naturally leaner than grain-fed meat, so good luck finding marbled 100% grass-fed meat), it's the unhealthiest part of the conventional meat. Conversely, whatever fat you can find on 100% grass fed or pastured animal meat will be healthy and you should eat it openly. Sadly, animals get fatter from the food they're not made to eat. That situation sounds eerily familiar, no? Animals eat the wrong food, they get fat. Humans eat the wrong food, we get fat. 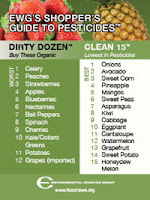 Buy organic vegetables and fruits from “The Dirty Dozen” list whenever possible. These are the Environmental Working Group's list (PDF) of the items where the highest level of pesticide and chemical residues was found when tested. You can read their reasons for why to follow their guide here. You can also find the full list of more than 24 fruits and vegetables here. Beyond that list, if you can't make it happen in your budget, go for whatever fruits and vegetables you can swing as local and organic, but don't sweat it if you need to mix it up. That's it! Since you're looking at three major macronutrient categories here, I'm just giving you the priority list of what to buy for the three main sources of those nutrients: Fats, Protein and Carbohydrates. I think that's the easiest way to break it down, and it's really not more complicated than that. For my take on the best forms of different food sources, check out this handy PDF guide. I've included rankings for eggs, poultry, beef, pork, lamb, seafood, veggies & fruit, nuts & seeds, fats & oils and dairy. Hopefully it's a helpful tool that you can print out and hang in your kitchen for reference on a regular basis. I just wanted to say that you rock and your blog is awesome! I run several blogs and am also an online marketer… and this (your site) is really good stuff (better than most enterprise level company's are putting out from site design, usability, formatting, and content quality and consistency as relates to the niche). Out of the over 100 feeds I subscribe to yours is the most fun to read and I come away truly nourished! From my perspective, if you put the search box to the right of the logo, in the top right of the site, and put your info capture to in the right side of the main rotating image in essence making the main image slot smaller (along w/ adding an incentive to sign-up)the usability of the site will improve and the list will be built faster. Something like "Subscribe to My Weekly VIP Newsletter and Get My Balanced Bites Eat and Be Healthy Action Plan Free"
i usually like to go to Sam's club every other week and stock up on produce that i don't have to buy organic because they rank low on the pesticides list (avocado, broccoli, citrus, melons), and they also have some organic stuff too. you can get a 3lb bag of broccoli for $4-5, and it usually holds up pretty well in the fridge. i use it in scrambles, as a stand-alone veggie, or as a back-up veggie. Just got introduced to your site and I'm very excited by what I've read so far. My dilema however is that I live in Michigan so we don't have to many organic stores nearby and it's not realy feasible to go to the farmer's market when I shop everytime or cost effective toss in two busy kids and you can see how my desire to eat more Paleo is fading. Any suggestions from you or other readers on places to shop or quick fixes for busy people? I have some links on my Resources page – one for eatwild.com and the other for an online source of quality meats, so check that out. Otherwise, I recommend hitting up Trader Joe's, Whole Foods or your regular grocery store and use my pointers to pick quality in the priority items and do what you can the rest of the time. The TYPE of food matters most, quality matters next. SO, avoiding poor nutrient-density and refined foods is really critical. Avoiding bread, pasta, sugar and other refined foods is your best bet. As for quick fixes, I'll be posting on snacks soon– with a PDF of course as well, but most of my recipes are pretty quick to prepare so keep your eyes peeled for them. I usually post one every week. looks like my diet is mostly on the baseline even though its all paleo. when we go grocery shopping and then we see meats that are like $19.99/lbs, we're often put off by it. so we go to what we consider 'normal' price. is that going to be a huge effect on my performance? i take the Robb Wolf's prescribed amount of fish oil … does that cancels it out? Excellent paleo budget tips. I also appreciate that you note that the type of food comes before the quality. Just doing that wins a big part of the battle … then the smaller details can be whittled down in time. Sorry – I love this blog but how on earth is anything grass-fed an item for those on a budget? As far as I can see the only budget cooking fat around is Louanna refined coconut oil – at about $5.79 for a two-pint tub it is half or less of the cost of organic virgin coconut oil. (Either that or lard – but I'm wary of the omega-6 content.) When you are on a "real" budget it's often because you have a low income and every penny counts. That also means that you can never afford the luxury of buying in bulk to take advantage of the price breaks you can get by stocking up on reserves. I live from one paycheck to the next and my definition of "on a budget" is a lot different to the picture painted here. I’d say try to eat ruminants more than pork or poultry, since the latter two suffer most from being switched to a CAFO diet–ruminants, for the most part, are still grass-fed most of their lives, although they tend to be finished on a grain feedlot, especially cows. I saw a list on an ancestral-diet type blog of how the fatty acid ratios change, and overall PUFA in a cow stays pretty much the same but it all runs to omega-6 in CAFO while retaining its omega-3 in grass-finished. So I’d say, go ahead and eat CAFO beef if you have to, including the marbled stuff. But go for as lean of cuts of poultry and pork as you possibly can if you eat CAFO versions of those meats. And get your cooking fats from coconut oil (the Lou Ana is fine–it’s not hydrogenated, I use it too) and butter. And *make the room* in your budget for that butter. It’s a source of vitamin A. But look around. Price by the ounce (include shipping costs in your calculations as applicable), and compare muscle meats to organ meats too. AND, compare eating CAFO meat and taking fish oil supplements, with just plain eating the grass-finished stuff but without the fish oil, in terms of price. Because taking the fish oil’s how you’re going to balance out that extra PUFA. I *don’t* recommend going vegetarian to avoid “off” fatty-acid ratios. You still get other nutrients from CAFO meat, such as vitamin B12 and thiamine, which you’re going to miss completely if you cut meat out all the way. Also, keep your grain and sugar consumption low to nonexistent. You will be *hungrier* if you include those foods in your diet because they will mess with your insulin levels. And rely on fats to bring real satiety–if you try to eat too much fiber to achieve it, you’ll be hungry half an hour later and on top of that, you’ll miss out on absorbing minerals because the fiber will whisk them out of your system. Also, learning how to make bone broth will be a lifesaver. There are various blogs that teach how to do it in a crock pot, if you already have one of those. Bones are cheap, even at a conventional grocery. Great reply. I have a recipe right here on the blog for bone broth in a crock pot and I also recommend ruminants over pork/poultry. I totally agree with this. For example, if you dont want to spend the money on grass feed ground beef or pastured chicken, buy the grass feed beef liver (1lb is about $2-$3) and the chicken livers (1lb is $1.20) from WholeFoods. Those are COMPLETE sources of protien, vitamins (A, C, D, B-complex) and minerals. I make pate every week with 1lb chicken livers, a sweet white onion, butter and olive oil (and spices of course), and that lasts me as a meal (with some vieggies) for 3 days, if not longer. Bone broth soups is another great way to go. If you select the right foods, and those that are most nutrient dense, you’d be surprised on how little money you can actually end up spending! Grassfed may not be affordable for all and in that case I agree about leaner cuts. Less expensive cuts may be reasonable if you can source it. Frankly, one of the cheapest ways is to get good fats by rendering tallow and lard as cooking oils. Good fat and great cooking quality. Inexpensive even if it takes an afternoon to render. I disagree about using the LouAnna coconut oil. It is very processed and goes rancid quickly. It is often the leftovers, the scrapings from the bottom of the bin of better oils. I buy the Nutiva expeller pressed for about $20-23 on amazon, I have it autoshipped, 2-54oz jars every two months, one jar will last me over a month and sometimes I have to pause the shipments. Thats $20 a month for an oil that is very nutritious and healing. I fully understand about having a budget, I’ve been a single mom on food stamps and I’ve been a single mom who barely didn’t qualify for food stamps and had to just figure it out. I am in a better position now but when the paycheck gets tight, we eat a lot of burger patties wrapped in lettuce (no bun) with avocado (another often left out very healthy fat) and homemade sweet potato fries baked up with a little olive oil, chili and garlic powders and sea salt. Also Costco is a great resource for us, we buy lots of the bags of organic frozen veggies, they last forever, and they now have the box of sweet potatoes that is something like $6. For our family of 5, stocking up when there are sales or when at Costco is absolutely key. Buying the organic butter at Costco is a little more up front but it will last well over a month and saves a lot in the end. It may be $9 (or whatever, I can’t remember off hand) up front for that huge package but figure $3-5 per single box at the grocery store, more for organic, and that same amount of butter would have been at least double the cost. I buy bulk packs of meat and divide it into meal sized portions and freeze. Awesome post! Those PDFs are awesome! Anything that makes it easier to shop and cook will hugely impact compliance! Like Robb Wolf says, people who are 'bored' with paleo are usually just lazy. Resources like this make even the laziest shopper/cook stay on task. Keep up the good work! @Martinla- I hear what you're saying about grass-fed meat, but I think you're missing the point of my article. The point here was to help people to understand what to prioritize when eating a Paleo diet. I, in fact, didn't say anyone HAD to buy grass-fed meat at all, but I am laying out the information from which you can learn and then choose what's best within your own budget. I understand that every penny counts for sure, so this is where I say to do what you can with what you have. I have provided the PDF to look at or print about quality levels of different foods- so when you can get it into your budget to get a better quality, then do it, if not, don't sweat it. I say fats are most important, then proteins, then carbs (veggies/fruits) when it comes to quality. Paycheck to paycheck for each person is different, the picture I painted may be different from yours, but that doesn't mean that the information can't be useful… rather than buying in bulk, you can buy whatever is on sale- and so on. There are ways to learn from this information even if it's not an exact set of rules- everyone makes their own choices based on priorities when it comes to food. Do whatever you can and feel is best within your means. If you would like to write a guest post about how you eat Paleo/whole foods on a "real" budget I'm happy to share that with my readers. Different views are always helpful! @Diane – thanks for your reply. Your pdf says palm oil is good, but was somehow under the impression that it wasn't. My concern with fats in particular is the omega 6 content. I'd like to minimize that so as to try to get the optimal ratio of omega 3 and 6 in my diet – which is what – 1:1? This is probably impossible for me as I do not eat fish of any kind and rely on taking fish oil capsules. This has to offset the fat in the meats I eat which are inevitably conventional grain-raised chicken and beef. I'll always buy lean – such as frozen chicken breast – but I can only ever budget for meat that is $2/lb or less. Also I eat butter and milk but not a lot. and the author of that page advises against saturated fats. As well as yours, other blogs I have high regard for are The Healthy Skeptic and Mark's Daily Apple, but the message is the same – expensive grass-fed, organic this and that. It would be nice to find resources for people who believe in the same food ethos but are on a tight budget. Read the Weston A. Price Foundation’s stuff about saturated fats. They are so, so necessary in the human diet, but some folks in the ancestral-foods movement just will not let go of the erroneous notion that these fats cause disease. I’d favor butter over milk if my budget was tight, and make bone broth for the calcium (and all the other nutrients found in bones, in their very best form!). Thanks for these replies. Saturated fat is definitely my first choice to eat as well as what I recommend! Had a patient who complained of the cost associated with trying to eat right and stumbled upon your site. Very well laid (layed?) out and just what I needed. Will be sure to plop a link on my web site. Thank you for this post. I currently live in Korea and finding grass-fed or pastured meat is a joke. I keep trying to determine some kind of “modified” version of Paleo for this environment and wonder if I’m really left with Paleo eating in the end. Your prioritization helps. In Korea, you’re best bets are seafood (in Seoul, you can find this fermented crab and chile dish from street vendors that is freaking amazing) and Kobe beef imported from Japan. Kobe steers are raised for much longer periods of time than American steers. They are grain finished for the last 6 weeks, but since they live longer lives on grass, they have much higher levels of CLA and omega-3 than most American beef. U have been a HUGE help to the Paleo movement and the many Anxietys that sometime come with people lookin to be to perfect on Paleo . Thanks for simplifying this trust me i have a youtube channel dedicated to health & fitness and many have mentioned you as a tremendous help ! Your paleo pyramid is off. Meats AND fats go on the big line together. Do what you need to to reprogram your mind so that you get over the myth that fats are bad for your health. They are actually very good for you and everyone needs to increase their fat intake. The placement of fats wasn’t to indicate their value in calories, but more so how much of them needs to be added independently of what naturally occurs in the foods we eat. Meats, nuts/seeds, and eggs – as well as lots of other foods – naturally contain lots of fats that we are doing fine with even if we don’t add extra on top. It’s very individual how much extra folks may or may not need or want to add. Thanks for the comment! Thank you for the clarification. Sorry I missed it in the article. Hi Dianne, Thanks for being amazing! I’ve bought your book and I love it. It’s reinspiring me everyday at the moment. I’ve got a quick question about nut butter. I soak and dehydrate my nuts on a very low heat. My kids love almond butter, so I’ve been making it myself, so that they are at least soaked. I note that the mixture gets pretty hot though before becoming creamy in my food processor. Will the oils go rancid and become toxic for them? I have one kid on the spectrum, so am super clean with his diet. But he is fussy and it is hard to find foods that he is allowed and will tolerate.